Precise neural circuit formation is critical for the adequate execution of innate behaviors. During nervous system development, growing axons are guided to their appropriate synaptic targets by numerous cell surface molecules1. Several guidance cues and receptor families have been found to be involved in axon guidance, which allows outgrowth to a target field2. Within the target region, however, how axons select the correct synaptic targets is not well understood3. In the case of innate behaviors, all of these instructions from axon guidance to synaptic target selection must be genetically-encoded to enable proper hard-wired circuit formation4. My research project used the hard-wired neural circuitry of Drosophila melanogaster to identify and characterize specific molecules involved in its circuit formation. The Drosophila melanogaster mechanosensory system is a powerful system to study the molecular basis of hard-wired synaptic targeting. Mechanosensory neurons have a stereotyped connectivity which can be reliably compared across animals5-7. Individual mechanosensory neurons can be identified and its synaptic connectivity can be quantitatively analyzed through imaging of its stereotyped axonal branching pattern5-7. In addition, mechanosensory circuit functionality can be evaluated by assessing the animals’ cleaning reflex in response to mechanosensory bristle stimulation8. To identify cell surface molecules required for hard-wiring of the Drosophila mechanosensory neural circuit, I performed a blind RNAi screen, from which the breathless (btl) gene was identified. Btl encodes a homolog of the fibroblast growth factor (FGF) receptor9. Previous studies have shown that btl is required for the migration of tracheal cells and midline glial cells during development10. However, little is known about the role of btl in the formation of neural circuits. The aim of this study was to elucidate the role of breathless in synaptic targeting of a Drosophila mechanosensory neuron using its synaptic connectivity pattern and its behavioral response as readouts. I hypothesized that reduction in btl expression would produce significant errors in the axonal branching pattern and consequently, an impaired behavioral response. To assess changes in the mechanosensory axonal branching pattern, RNA interference in a specific mechanosensory neuron was induced using the GAL4/UAS system. This leaves the rest of the animal unperturbed by the genetic manipulation. In addition, the GAL4/UAS system was used to overexpress btl. The mechanosensory neuron of mutant and control animals were assayed by carbocyanine dye labeling and fluorescent imaging for subsequent quantitative analysis. The neuron’s functional output was evaluated by stimulating the mechanosensory bristles to induce a grooming reflex8. Results showed that knockdown of btl by RNA interference produced significant changes in synaptic connectivity of the mechanosensory neuron, where fewer branches were observed when compared to control animals (Fig. 1a, b). Quantitative image analysis revealed a reduction in axonal arbor complexity due to a decrease in the total branch length (P < 0.01, One-way ANOVA followed by Dunnett's post hoc pairwise comparison) and total branch number (P < 0.01, Nonparametric Mann-Whitney U test) (Fig. 1d-f). The frequency distribution of total axonal branch length for btl knockdown animals (n = 31) was shifted to smaller values when compared to control flies (n = 40) (Fig. 1d). These observations demonstrate that btl does not affect guidance of the mechanosensory axon into the target region, but it rather plays a role in branch growth. On the other hand, overexpression of btl (n = 34) increased arbor complexity, and ectopic branches were observed (Fig. 1c). Total branch length (P < 0.01) and branch number (P < 0.0001) were significantly increased when compared to control animals (Fig. 1d-f). Frequency distribution of total branch length for animals with btl overexpression was shifted to higher values, where 33% of animals had a total branch length of 1000µm whereas most of control animals had lengths of 900µm (Fig. 1d). Altogether these results indicate that btl enables proper growth of axonal branches and that regulated btl expression is required for mechanosensory axons to form their precise connectivity pattern. Furthermore, a T test assessment of the functional output of the mechanosensory neuron by eliciting the cleaning reflex revealed that animals with reduced btl expression had a reduced frequency of response to stimulus (28%) when compared to control animals (53%) (Fig. 1h). Behavioral assessment of animals overexpressing btl was not performed in the context of this essay. The obtained results indicate that proper btl expression levels are required for proper circuit formation and behavior. Overall, results indicate a novel function of btl in circuit formation. 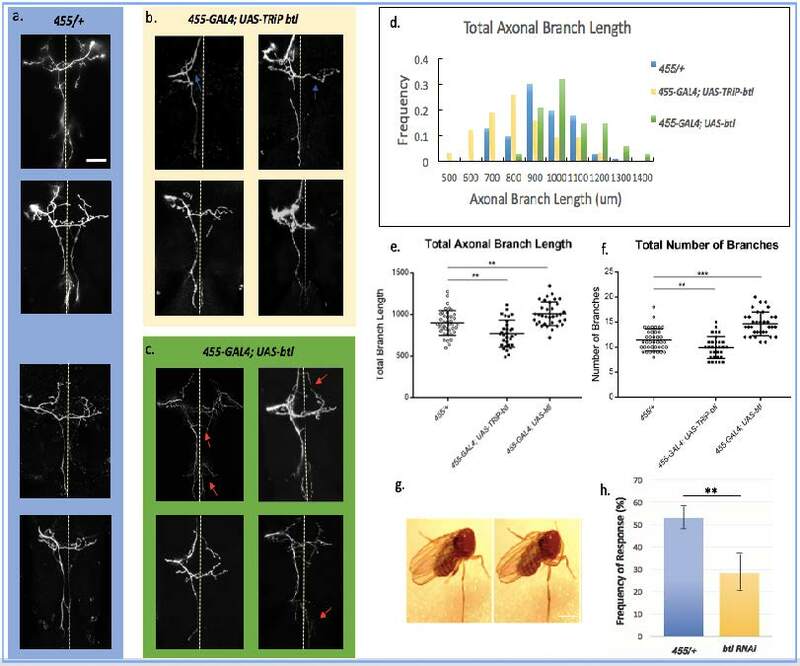 Knocking down btl in a specific mechanosensory neuron in Drosophila melanogaster caused a reduction in axonal arbor complexity. Overexpressing btl led to additional axonal branches and increased total branch length. These results suggest that breathless is involved in axonal outgrowth. Assessment of Drosophila’s behavior showed that btl knockdown mutants had a reduced cleaning reflex response solely for the affected mechanosensory neuron. We also showed that neural circuit formation and function are sensitive to levels of btl expression. To further reveal the role of breathless in neural circuit formation, its ligand, branchless could be knocked-down in different target neurons11. The other FGF receptor homolog heartless shares a similar intracellular pathway12, and thus it is possible that heartless also plays a role in circuit formation. My results are particularly relevant when considering neural developmental disorders caused by dosage sensitive genes such as Down Syndrome Cell Adhesion Molecule (DSCAM), which has been found to play a critical role in neural circuit formation13-15. Uncovering the molecular mechanisms of circuit formation might enable a better understanding of the underlying causes of altered neural wiring in various intellectual disabilities. Figure 1. Knockdown or ovexpression of breathless in single mechanosensory neurons disrupts axonal branching and the behavioral response. (a) Representative images of the axonal branching pattern of a specific mechanosensory neuron in 455-Gal4/+ control animals. Scale bar = 50µm. (b-c) Knockdown of btl by RNA interference or btl overexpression alters the axonal branching pattern within the central nervous system. Blue arrows point to absent branches and red arrows point to additional branches. (d) Distribution of axonal branch length for the three genotypes: 455-GAL4/+ (n = 40) and 455-GAL4; UAS TRiP-btl (n = 31) and GAL4; UAS-btl (n = 34). Approximately 30% of control animals had a total axonal branch length of 900µm (blue bars). Axonal arbor sizes with btl RNAi were shifted to lower values (yellow bars). Increasing btl expression produced the opposite effect (green bars). (e) Quantitative analysis of total branch length for the three genotypes revealed a significant difference in axonal arbor size between control animals and both mutants (P = 0.0013 for control vs btl knockdown mutants and P = 0.0039 for control vs btl overexpression mutants). Error bars represent one standard deviation from the mean. (f) Total branch number was compared between control animals and mutants. Axonal arbors in knockdown animals have significantly fewer branches whereas overexpression mutants have significantly more branches (P = 0.0066 for control vs knockdown mutants and P < 0.0001 for control vs overexpression mutants). (g) Adult females from each group were tested for the cleaning reflex response. As a control, the anterior bristles were first stimulated to pre-select for positive reflex responses. Fluorescent dye was then applied onto the posterior (genetically manipulated) bristles. A response was scored as positive if the rear legs cleaned the labelled bristles and spread the dye onto the rear legs. (h) Stimulation of the mechanosensory bristles in 455-GAL4; UAS TRiP-btl (n = 92) significantly reduced the frequency of the cleaning reflex when compared to control animals 455- GAL4/+ (n = 34) (P < 0.0098). Approximately 53% of control animals elicited a response whereas only 28% of flies with btl knockdown responded to bristle stimulation. Errors bars represent standard error of the mean. Tessier-Lavigne, M., and Goodman, C.S. (1996). The molecular biology of axon guidance. Science 274, 1123–1133. Hassan, B.A., and Hiesinger, P.R. (2015). Beyond Molecular Codes: Simple Rules to Wire Complex Brains. Cell 163, 285–291. Ullrich, B., Ushkaryov, Y.A., and Südhof, T.C. (1995). Cartography of neurexins: More than 1000 isoforms generated by alternative splicing and expressed in distinct subsets of neurons. Neuron 14, 497–507. Shen, K. (2004). Molecular mechanisms of target specificity during synapse formation. Curr. Opin. Neurobiol. 4, 83–88. Chen, B.E., Kondo, M., Garnier, A., Watson, F.L., Püettmann-Holgado, R., Lamar, D.R., and Schmucker, D. (2006). The Molecular Diversity of Dscam Is Functionally Required for Neuronal Wiring Specificity in Drosophila. Cell 125, 607–620. Cvetkovska, V., Hibbert, A.D., Emran, F., and Chen, B.E. (2013). Overexpression of Down syndrome cell adhesion molecule impairs precise synaptic targeting. Nat. Neurosci. 16, 677– 682. Neufeld, S.Q., Hibbert, A.D., and Chen, B.E. (2011). Opposing roles of PlexinA and PlexinB in axonal branch and varicosity formation. Mol. Brain 4, 15. Kays, I., Cvetkovska, V., Chen, B. E. 2014. Structural and functional analysis of single neurons to correlate synaptic connectivity with grooming behavior. Nature Protocols 9, 1-10. Reichman-Fried M., Shilo B.Z. Breathless. (1995). A Drosophila FGF receptor homolog, is required for the onset of tracheal cell migration and tracheole formation. Mech. Dev 52, 265– 273. Oshiro T, Emori Y, Saigo K (2002). Ligand-dependent activation of breathless FGF receptor gene in Drosophila developing trachea. Mech. Dev 114, 3–11. 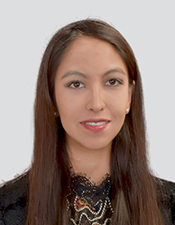 Sutherland D., Samakovlis C., Krasnow M.A. (1996). Branchless encodes a Drosophila FGF homolog that controls tracheal cell migration and the pattern of branching. Cell 87, 1091–1101. Muha, V., & Müller, H.-A. J. (2013). Functions and Mechanisms of Fibroblast Growth Factor (FGF) Signaling in Drosophila melanogaster. International Journal of Molecular Sciences 14, 5920–5937. Chen, B. E., Kondo, M., Garnier, A., Watson, F.L., Püttmann-Holgado, R., Lamar, D.R., Schmucker, D. 2006. The molecular diversity of Dscam is functionally required for neuronal wiring specificity in Drosophila. Cell 125, 607-620.